KODI Rafting Owners Dave and Amy McGrath love living in the Colorado mountains and spending time on the river with their two children. The two have been rafting together since 2002 when Dave began his career as a raft guide on the Arkansas River. 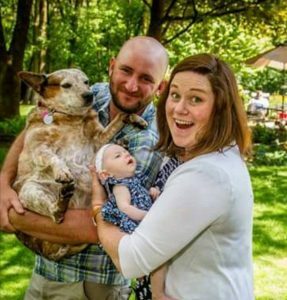 After graduating from Kansas State University and starting a family in 2009, Dave and Amy set out on new adventures to reconnect with their roots, eventually returning to Colorado. Dave and Amy share a passion for the river and are excited to pass the KODI legacy on to their daughter Danni and son Thomas. If Dave isn’t your raft guide, he’s likely driving your bus with Thomas by his side. Amy and Danni, along with Scout the pup, will greet you when you return from your trip. Be sure to ask Danni for her famous smoothie in the coffee shop! 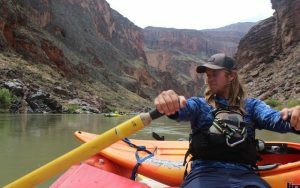 Chas, originally from Asheville, North Carolina, has been a professional river guide since 2007. 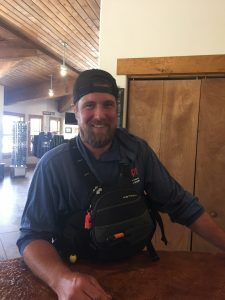 He came to KODI in 2013 and has since guided on the Arkansas River where he is also a safety kayaker. Chas’s favorite river to raft is the Nolichucky in North Carolina. “It’s where it all began for me, where I learned how to guide. It’s where I fell in love with this sport,” says Chas. In the off season, you’ll find Chas guiding overseas, specifically on the Tully River in Australia. Chas has lived in Australia, Costa Rica, and New Zealand. When he isn’t chasing the sun, he’s hanging with his dog Rufus, kayaking, or playing the drums. Krista, aka “Mama Wolf,” has rafted commercially since 1998. She is known throughout the Arkansas River Valley for her longevity on the river and for her amazing tan! This magical water sprite has been at KODI since 1999 and is our leading lady! She heads up the KODI training program for new guides and spends her time off the water making sure KODI is a well-oiled machine. Krista is a wealth of knowledge and a true asset to the boating community. Out of all the rivers KODI rafts, Krista’s favorite section is the Numbers on the Arkansas River, where she loves rapid #6. “It’s technical and the first of the Class IV rapids you’ll hit. It indicates the potential of your paddlers and what the rest of your day has in store,” says Krista. Krista lives in Summit County with her husband, Danny, and their three dogs, Rosco, Pigpen, and Yackson. Krista is also an avid golfer, often managing to play at least 18 holes every week on top of her busy schedule. In the off-season, you’ll find her at Copper Mountain on her snowboard or behind the bar at Jack’s. 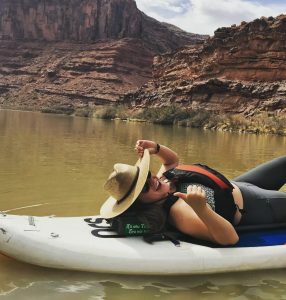 If you have the chance, ask her how many times she’s rafted the Grand Canyon! “Coyote Can” Terry, originally from Eureka Springs, Arkansas, has rafted with KODI since 2014. Terry’s favorite rapid is the Staircase in Browns Canyon, a series of seven succinct rapids that form a long wave train. 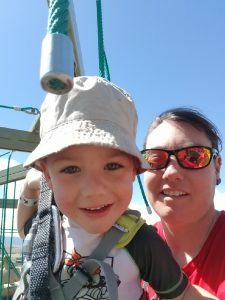 “It’s splashy, mimics a roller coaster ride, and is a great way to get in some smiles before you wrap up your Browns Canyon raft trip,” says Terry. In the off-season, Terry guides snowmobile tours just above the headwaters of the mighty Arkansas River. 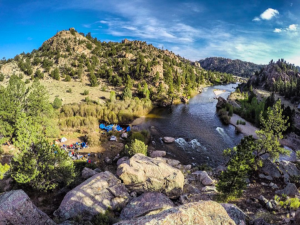 When he isn’t offering his guide services in the mountains or on the water, you’ll find him hiking Colorado’s many trails, riding his mountain bike, or skiing Colorado’s famous powder. With many years of experience under his belt, Jay navigates our rivers with confidence. 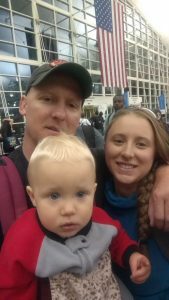 Jay lives in Frisco and enjoys spending time with his wife, Jennifer, and sons, Aiden and Samuel. Don’t be fooled by his sense of humor. 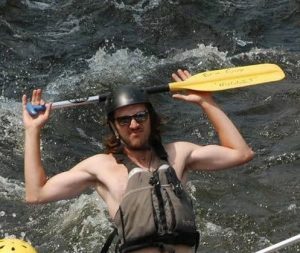 Jay will keep you safe as well as entertained while rafting Colorado’s awesome rivers. Zach, or Flake’s as he is known by the KODI family, is originally from Cincinnati, Ohio. 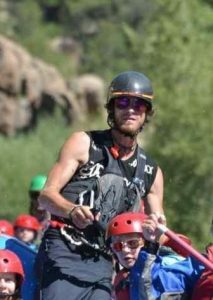 This is Zach’s eighth season rafting and all have been with KODI. He used to backpack and hike all the time, but after kayaking and rafting, Zach decided he would much rather see the outdoors from the water. “I like it more because the water does the hiking for you,” he says. 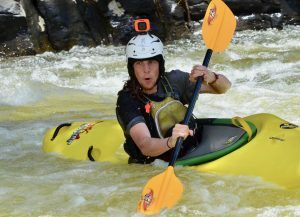 Zach was introduced to kayaking and whitewater rafting through a college roommate who guided on the Ocoee River in Tennessee. Some of his favorite memories are from his start on the east coast during college rafting the Gauley, Telico, Chattooga, Cumberland and the Ocoee rivers. He graduated from Campbellsville University with a degree in Business Management and an emphasis Marketing. Zach and his beautiful wife Sarah have a one year old son Coleman Tyler Flake and two dogs named Tucker and Sugar. When he isn’t on the river, Zach loves to run the non-profit High Elevation and wrestle. He even won two national titles for wrestling in college and won a state title in high school. He also loves to fish, hunt, golf, scuba dive, swim, bike, travel, play frisbee golf and poker, watch movies, and anything else life allows him to experience that he’s interested in trying. 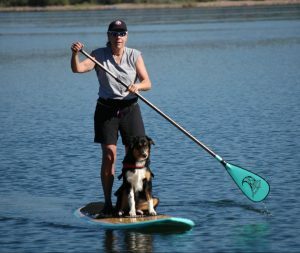 Stacey has guided with KODI for 8 seasons. Her favorite river is the Blue River. At home, she likes to bake bread and can jams and pickles. Stacey is currently attending CMC for a certificate in Outdoor Education. Her dream is to one day fly helicopters. Stacey lives in Frisco with her dog, Stella, cat, Pixie, and betta fish, Mr. Peri Winkle. Ian is in his fifth season guiding at KODI. Ian counts himself fortunate as to NOT have been given a nickname on the river as so many guides are. His favorite river to raft is the Arkansas, “She’s my home stretch,” he says. Make sure to ask him to tell his favorite bus joke during your shuttle! Mitchell joined the KODI Family in 2016 as part of KODI’s river guide training program. His favorite stretch of river is the Numbers located on the Arkansas River. “The Numbers provides a little bit of everything—really exciting rapids with just enough flat water to relax and soak in some great scenery,” says Mitchell. Originally from Lansing, Michigan, Mitchell graduated from Michigan State University with a degree in music performance. He’ll even play the drums for you—if you’re nice! Dani, originally from right outside of the greater Philadelphia area in South Jersey, is known around the boathouse as Deb, Deborah, or Debbie. She’s boated with KODI since 2016. Her favorite section on the Arkansas River is the “Numbers”, it keeps your adrenaline high, and you’re guaranteed to get wet. Her favorite rapid would have to be Twin Falls in Lower Browns Canyon on the Arkansas. Although it is short and sweet, that drop gives some of the best reactions from guests! In the winter Dani is a snowboard coach for Team Summit, and teaches snowboarding and skiing at Copper Mountain. When she is not on the river or on the mountain you will find her furthering her outdoor education through different certifications, taking photos, or traveling to new countries. Dani graduated from West Chester University of Pennsylvania studying Exercise Physiology and Psychology, and was apart of the conference winning swim team for 3 years in a row. 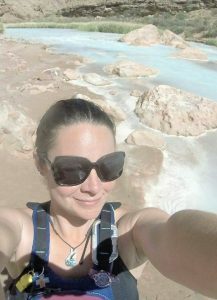 Her favorite memory is rowing 16 days down the Grand Canyon with some of her fellow raft guides from KODI and the Arkansas Valley. Donny is originally from Pocatello, ID and ventured to Colorado for college at Colorado State University in Fort collins in 2009. It was there where he starting his rafting career on the Cash La Poudre River in 2011. Donny is a new addition to the KODI family this year but has been guiding commercially for the last 7 years with no end in sight. In the winter Donny makes the transition from a river rat to a ski bum and works as a ski and snowboard tech at Christy Sports. Josh, who hails from Minnesota, has boated with KODI since 2016. His favorite river is the Blue River. “It’s wet and wild and a great way to spend half a day on the water,” he says. Josh spends his winters guiding snowmobile tours in Colorado. He’ll tell you he doesn’t have any hobbies aside from rafting, but we think he works pretty hard at making folks smile! Eitan, “Shooter” or “Hey Tom” as he’s known on the river, is originally from Milwaukee Wisconsin. He was a full time guide with KODI for eight years and has been a part time guide for the past three. He loves to see people he trained years ago become trainers and senior guide’s themselves. The numbers section of the Arkansas river is his all time favorite. Particularly rapid #5, “It’s a solid drop that’ll spank you if you’re not on your A-game,” he says. He also really loves overnight trips, mainly because the food is so good! Eitan has also rafted in Chile and New Zealand! He has a beautiful one-year-old daughter, and another baby on the way. His wife, Mary was also a raft guide for a few years. Eitan, his family, and his two dogs live in Leadville year round and he works at a local brewery when he isn’t on the river. 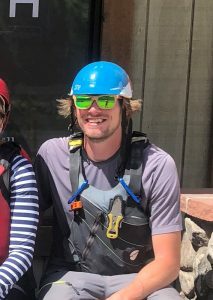 Make sure to ask him how many times he has rafted down Brown’s Canyon! Here’s a little hint, it’s probably way higher than you’d expect! Regan, or Ragnarr as she’s known on the river, has rafted with KODI for three seasons now. She is originally from Connecticut where her family currently resides. She attended Stony Brook University and was captain of her soccer team there. She has completed her B.A. in environmental design, policy, and planning. Her favorite river to raft is the Arkansas river because it houses one of her favorite rapids, Staircase. “I love this rapid because it is so long and splashy! So much fun!” she says. During the winter season, Regan is truly a jack-of-all trades: she is a photographer at White Mountain, snowmobile guide and also the go-to girl for all the odd jobs at Copper Mountain. 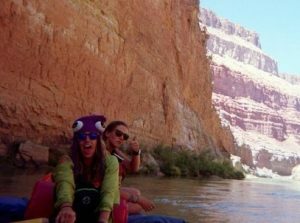 Her favorite rafting memory is when she rafted the Grand Canyon; she wore a squid hat and shredded an 11 foot saber-tooth boat! Be sure to ask her all about it, maybe you’ll get lucky and she’ll tell you some of her favorite jokes too! 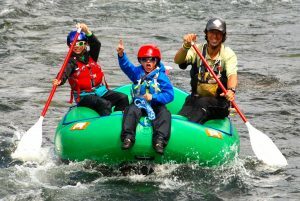 Brandon joined the KODI rafting family four years ago and has loved every minute of it. He attended Doane College in his home state, Nebraska. 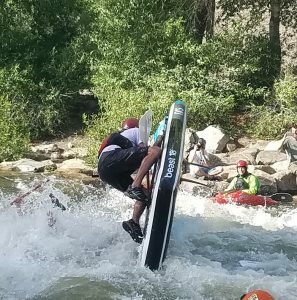 His favorite rapid is the Class IV Lower Canyon rapid on Clear Creek because it’s fast, narrow, and super technical (it starts with two 8 foot drops)! In the winter, Brandon guides snowmobile tours, and when he isn’t rafting in the summer, you can find him on the golf course! CT, full name Chris, is originally from upstate NY. This is his third year as a raft guide and all have been with KODI. CT’s favorite river to raft is the Gauley River in West Virginia because of the Gauley Fest. 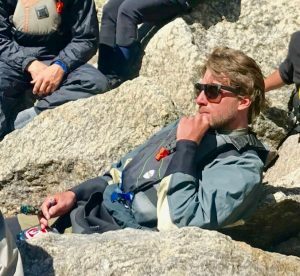 In the off season, CT is a “ski bum,” but he also loves to kayak, mountain bike, and golf when the weather is right. His favorite rapid on the Arkansas is Pinball, “It’s so much fun to maneuver the boat through the rocks,” he says. Jasmine, or Jasminator as she’s known on the rive, is originally from Lakewood, CO. She went to college at Colorado Mountain College in Glenwood Springs. Jasmine has worked with KODI for two seasons and in that time has discovered that her favorite rapid is Staircase located in Brown’s Canyon. Her favorite joke to tell on the shuttle buses is the one about Snoop Dog and his umbrella. Listen carefully on your shuttle, you might hear her tell it! When Jasmine is not on the river, she enjoy a wide range of activities, from hiking to rock climbing, skiing, cliff-jumping, skateboarding, and overall just being outside as often as possible. 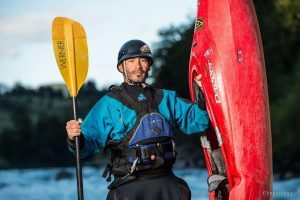 Sergio has been a raft guide for over thirty years but has just joined the KODI family this year. Originally from Chile, Sergio has lived Italy and the United States. He can speak four different languages – Spanish, Portuguese, Italian, and English – and he studied video programming and production at University in Santiago, Chile. Sergio’s favorite river to raft is the Futaleufu in Patagonia, Chile. He loves this river because it houses his all-time favorite rapid, Mondaca, a class IV+ section of the river that is highly respected by all who raft it. Sergio is a professional kayaker, and was even on the national team in Chile. Because of his love for the sport, Sergio tends to follow the good water around the world, so he never really has an off season. 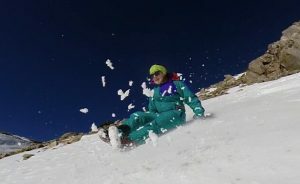 On the off chance that he finds himself somewhere with snow, you can find Sergio skiing and snowboarding. James is originally from Atlanta and it is his first year guiding with KODI. 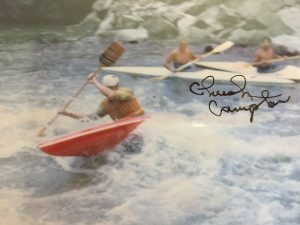 However, he has been paddling whitewater for 4 years. His favorite river is the Upper Colorado because of the beautiful views and wildlife. In the winter, James teaches snowboarding in Breckenridge. 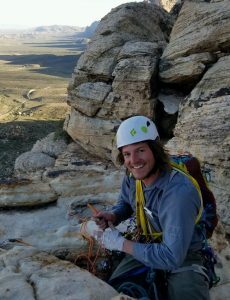 He graduated from Georgia State University with a degree in Spanish in 2008, and Colorado Mountain College with degrees in outdoor education and Paramedics in 2018. James spent over a year hitch-hiking around Europe and the Middle East. He loves to play drums and guitar, and used to play in a band! Ben, known as Darby or Darbs, has been a raft guide for five years three of which have been for KODI. 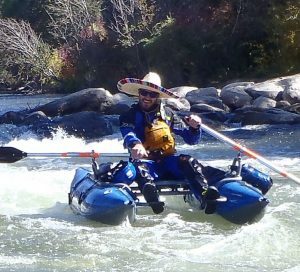 He’s had an awesome opportunity to raft the American, Yuba, and Middle Creek rivers in California and had such a blast boating all three. When he’s not working, you can find Ben camping by the river counting stars and writing poetry. Ben is a fun-loving dude who always has a smile on his face. He lived in Hawaii for five years; while there, he discovered a love for long romantic walks on the beach, with his fiancee of course! Ask him about the time he stepped on a washed up jellyfish! Luke was born and raised in the Plains of Kansas. He moved to Buena Vista for the mountains but stayed for the Arkansas River. His favorite rapid is Zoom Flume because of the reaction it gets from paddlers. 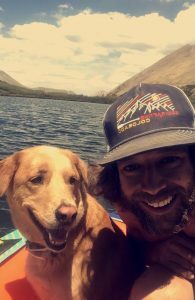 Luke and his puppy Bail enjoy hiking, slack-lining, mountain biking or anything outside when not on the river. Aaron, originally from Boerne, TX, is participating in his first season with KODI. His favorite rapid is Widow Maker on the Arkansas River and he loves to tell the joke about the man and the doctor on all the bus rides. During the off season, Aaron works as a Youth Ski Instructor at Copper Mountain. He will be going into his third season as an instructor this Winter. Aaron attended St. Edward’s University in Austin, TX and lived in Granada, Spain for one semester. He has two older brothers and one younger sister that he loves dearly. He also loves rock climbing, music, spike-ball, fishing, and reading. Jan came to Breckenridge in 1980 for the skiing & never left. She’s been with KODI since 2014 and is known to some in the KODI family as “Mamma Llama.” She was born in Zurich, Switzerland but raised in Denver, Colorado. 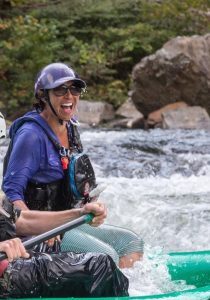 Jan loves to raft the Yampa River. “The coolest thing I learned on the Yampa River was how to make a sauna with paddles and plastic,” she says. During the off season, Jan skis, rows racing sculls on Lake Dillon, and paddle boards. Jan is married and has one fantastic daughter, a dog named Kona, and a cat named Turbo. Lilli, originally from Frisco, Colorado, is in her first year at KODI. She is currently a student at Colorado School of Mines and is studying Civil Engineering. Lilli is a very proud dog mom and loves to ski in the off season. Her favorite river to raft is the Blue River because of the scenery. Kathryn joined the KODI family in 2016, and has so loved working with all of these amazing people! 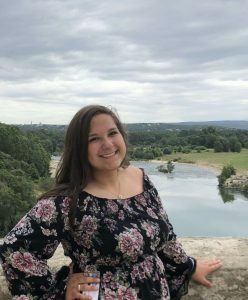 Originally from Buena Vista, Colorado, Kathryn attends Colorado Christian University where she is working on completing her Elementary Education Licensure. When she’s not working, Kathryn loves to hike. 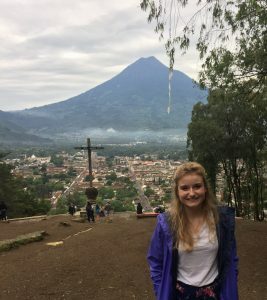 She recently got the opportunity to hike a volcano in Guatemala! 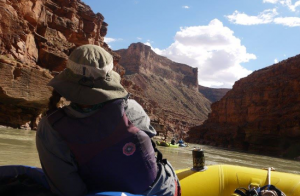 Kathryn’s favorite section of the river to raft is Brown’s Canyon. “It’s so much fun! The perfect amount of action and adventure with such an amazing view,” she says. Kathryn loves to raft with her family, and is out on the water as much as possible. Ang moved to Summit County, Colorado in 2014 after graduating from West Virginia University with a degree in Public Relations and Recreation, Parks & Tourism Resources. She came for the winter, but stayed for the whitewater! This is her third season with KODI and she loves the high pace and adventurous environment that surrounds the industry. Her favorite section of whitewater is the Lower New River in Fayetteville, West Virginia. She spent her college summers working in the New River Gorge, racking up lots of wild and rowdy times on the New & Gauley Rivers. In her free time while not rafting, she enjoys SUPing down calmer sections of whitewater, traveling, backpacking, skiing, and following around the greatest band in the world….Widespread Panic. 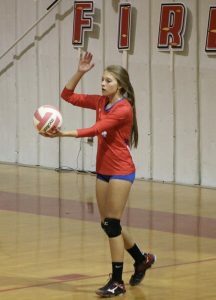 Rylie, originally from Parker Colorado, will be a Junior at Buena Vista High School in the Fall. She loves to travel and her favorite destination was Barcelona, Spain. In the off season, Rylie plays soccer for BVHS and spends most of her free time painting, drawing, taking photographs, and doing ceramics. Rylie also really loves dogs, she has two but wants at least four more! 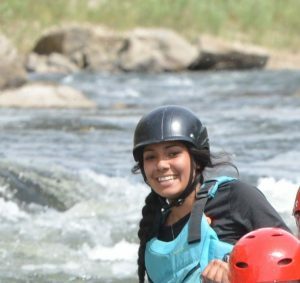 Rylie’s favorite river rafting experience is Brown’s Canyon because it houses her favorite rapid, Zoom Flume. This is Rausee’s first year with KODI and she has had such a blast. She was born and raised in Buena Vista, Colorado, and will be attending Buena Vista High School as a senior in the Fall. 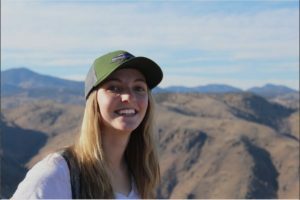 Rausee loves to play soccer and volleyball for the BVHS teams and when she’s not working or playing sports you can find her hiking, biking, long-boarding, or paddle-boarding. Rausee loves to raft Brown’s Canyon and her favorite rapid is Widow Maker. “I love the adrenaline rush it gives me! It’s fun, and crazy, and just the right amount of scary,” she says. Elana, or E, was born and raised in in Petersburg, Florida, but is now a permanent resident of Colorado along with her family. During her time in Florida, Elana became an experienced sailor and taught kids how to sail their own small boats. Her love for sailing quickly sparked a love for all water sports and is thus the reason she wanted to work at KODI. This is Elana’s first year at KODI, and she is completely in love with the industry. During the off season, Elana spends a lot of time with her cat, Willy, who acts more like a dog. She also loves to ski, snowshoe, hike, bike, and pretty much anything outside. Chuck has driven for KODI Rafting for over ten years and has been rafting and kayaking for much longer. His favorite river to raft is the Arkansas River. “It has the best sunshine and all the best rapids,” he says. He also loves to raft Lower Bear Creek and Cottonwood Creek. Although he has never guided a commercial trip, Chuck’s knowledge of the river is by far one one of the very best. Leah has been driving for KODI for three years. She has loved getting to be a part of such a great family both on and off the bus. She has a son named Beau and takes him on all the shuttle rides with her! Maybe you’ll see him on your shuttle ride! Although she doesn’t get out on the river much, her all time favorite rapids are Zoom Flume and the Stairs on the Arkansas River. Her favorite joke to hear the guides tell on the bus is called the Priest and the Raft Guide, “It’s so funny! It gets me every time,” she says. A little known fact about Leah is that she has two Tigger tattoos and wants quite a few more!